Auto Mate Systems Limited has recently installed a site wide traffic control system at a large GlaxoSmithKline factory site in Maidenhead, UK, consisting of Site Wide Traffic Lights, Radar Speed Signs, VMS (variable message signs) and Gate Automation, linked via a long range radio network system, to a master touch screen control unit installed into the reception area. Large numbers of heavy transport vehicles (HTVs) from all over Europe enter their site to make daily deliveries. Auto Mate provided a clever solution to this by installing a series of five traffic lights throughout the site, linked via the long range radio network system, allowing control to be given to the security team in reception using both the touch screen control unit as well as a PC. 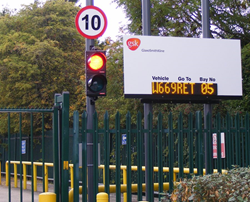 The control unit also allows the opening of both the entrance and exit gate barriers gates across the site, as well as displaying which parking bay HTV drivers should head to via the two large VMS display signs placed around the site. The VMS signs display both the vehicles registration number and which bay they should head to. Partial control of the system was also given to employees working in the goods inward department via a push button system which, when pressed, would automatically hold the previous traffic lights on red whilst a vehicle was unloaded. This allowed forklift trucks to come out and safely unload a vehicle before another HTV was allowed to pass. At any one time the security team at reception, via their master touch control unit, could see what color the individual traffic lights were on, as well as what gates were open/closed. The barrier system was also interlinked to the fire alarm network across site, meaning that in the event of a fire alarm the complete system adopts optimal conditions to facilitate safe evacuation. In order to enforce the speed limit, Auto Mate installed 4 vehicle actuated radar speed signs across the site to show what speed the vehicles were travelling at, alerting the driver if they were going over the speed limit by flashing red and warning the drivers to slow down. Auto Mate Systems Ltd is a quality provider of traffic control systems, including automatic traffic barriers, sliding and swing gates, road blockers, automatic bollards and pedestrian turnstiles for traffic management and road safety in a wide range of industrial, commercial, administrative, recreational and educational facilities. From its base in the central UK near Manchester, Auto Mate creates traffic management solutions for a variety of customers in the UK.